I haven't been a big fan of Albert Campion, Margery Allingham's Golden Age detective, since I watched a couple of episodes of the television series and hated it AND since I made the mistake of reading one of her worst books (don't ask me the title I've purposely forgotten it) as my first Campion try and swore I'd never read another primarily because the book was filled with anti-Semitic crap. Oh, I know, I put up with a bit of that from Dorothy Sayers and even Agatha Christie and a couple of others from time to time, but this was really REALLY objectionable stuff do I swore I'd never read another Allingham book. But then time passed and I saw some recommendations (by people I admire) of a couple of other Allingham books which were thought to be exceptionally good so I wavered. MORE WORK FOR THE UNDERTAKER was quite excellent as was BLACK PLUMES (which didn't have Campion in the plot and didn't miss him). So I decided that the book I'd hated was an aberration. We'll see as we go on. Campion is an acquired taste which I've never really acquired so I'm not going to pretend that I really like him very much, but in TRAITOR'S PURSE he's got amnesia so his personality is altered for the better and his 'man' Lugg doesn't muck up the works too much. We have a very promising beginning in this particular book: a man wakes up in hospital unable to remember who he is and what's happened except that he has a bad headache and the vague memory of a vitally important thing he must do. He overhears some chatter and surmises that he is being kept under guard for attacking a policeman - uh oh. So he does what any self-respecting hero would do, he escapes (through a series of fortuitous incidents) from the hospital in the dead of night (dressed as a fireman) and heads off for parts unknown. "Any incongruity in the costume did not occur to him. He was still moving with the simple directness of emergency. There was danger behind him and something tremendously important ahead. He was going away from the one and approaching the other. It appeared both sensible and elementary." He must get his memory back since he knows in his gut that time is of the essence and his mission is one of earth-shattering importance.Talk about blundering about in the dark - it's a good thing that the amnesiac has a good estimation of his own abilities as he heads out into the night looking for a car to steal. After a coincidence or two and a smattering of good fortune, the amnesiac eventually winds up in a limousine with a plucky young woman named Amanda and her male passenger, an older man named Mr. Anscoumbe. Unexpectedly, the young woman knows the amnesiac as Albert Campion and seems anxious to help him continue his unknown mission. Through things said and unsaid Campion assumes he and Amanda are married. An idea which doesn't startle him as much as it ought since in his own wary way, he finds the girl delightful. However later we learn that they are not married only affianced and Amanda wants to break up the relationship since she is falling in love with another man. But that's neither here nor there except as it affects Campion's sense of self and his feeling that he somehow deserves what's happening and is torn about it - more so as time ticks away and he reacquaints himself with Amanda whom, it turns out, he's known since she was 17. At any rate, they drop off Mr. Anscombe at his house but not before the number '15' is brought to Campion's attention several times in conversation. What can it mean? They then drive to the nearby home of Lee Aubrey, wealthy charismatic Principal of a local scientific society which runs the nearby town of Bridge through some sort of hereditary organization known as the Masters of Bridge. (I never did get the hang of this but I got the feeling that it wasn't necessary that I should.) Lee Aubrey is at the head of the Masters and it seems Albert Campion and Amanda are late for dinner at his 'perfect Georgian house' at 'The Institute' - turns out they are staying at the house. Mr. Anscombe is expected later as well. All this is explained in bits and pieces to a weary and wary Campion who is trying like mad not to let on that he is clueless. "The drawing room of the Principal's house at the Institute of Bridge was typical both of its owner and of the foundation; that is to say, it was a genuine period piece which had been considerably improved by modern austerity and modern money. Its fluted columns and Wedgwood plaques had been stripped and cleaned and each piece of furniture that it contained had been chosen with care and a splendid disregard of cost either one way or the other, so that an old fruit-wood chair picked up for half a crown rubbed shoulders with Mozart's own spinet, acquired at considerable sacrifice. When Campion followed Amanda in he walked into one of the few recognizable atmospheres of that nightmare evening. Intelligent academic formality, than which there is nothing more indestructible, closed over his head like glue." Bluffing his way through and blaming a bump on the head for any vagueness, Campion tries to figure out the rules of the game as it goes along. This is handled exceptionally well by the author and makes for added intrigue since we and our hero know that something big is afoot, but not what it is and how it's to be dealt with. And what about that number 15 thing? Mr. Anscombe fails to arrive later in the evening and a Superintendent Hutch of the local police shows up instead. It seems that Mr. Anscombe (who had also been Hereditary Secretary to the Society) has been found dead, his neck broken. The eye of suspicion lights on Albert Campion. Though as events progress it's obvious that Hutch knows Campion and regards him in a different light other than suspect. Later Hutch will send a signal that he is waiting outside and to Campion's surprise, off they go on a mysterious night time adventure. Soon we're traipsing through 'back doors' into secret caverns used by the Masters as a meeting place, a storage base and more. The whole set-up seems a bit strange especially the 'hereditary' aspect of it all. But it's England, and you know how they love their ancient laws secret enclaves and such. Anyway, after the night jaunt to the caverns in which Campion had spotted not only some very interesting correspondence and minutes from a meeting but also on further investigation of the labyrinth, a large group of lorries underground, he is taken on a day-time tour of the Institute of which Lee Aubrey is Principal. Campion meets a scientist working on a new explosive (a kind of super hand grenade) and sees other work going on all perfectly above board in furtherance of the war effort - it is 1941 after all. And Aubrey explains that the main work and wealth of the Society lies in patents. Lucrative patents of all sorts of inventions and improvements on inventions. Campion knows the mission he is on is part of that same war effort and has come to know (thanks to Hutch and their night time adventuring) that it definitely has something to do with the caverns and the august institution known as the Masters of Bridge. He has also assumed that the number '15' which is a date two days hence gives him just 48 hours to do what needs doing. "Good God, he was mad! Here he was stumbling about in the dark and seeing monsters where there were bushes and innocent shadows where there might be death traps, and all the time the precious hours were racing past. He was a lunatic, very possibly a dangerous lunatic. Mercifully he was gradually getting the intelligence to recognize the fact." This is a complicated inventive plot full of twists and turns not helped at all by the fact that the guy in charge has amnesia - for in charge he is as even Scotland Yard is working with him. Campion is feeling his way along not sure what he will be required to do except that the government (he finds out) is counting on him and that there's no time to lose - at most he has a couple of days to offset a huge plot against the government and people of England. The enquiry crept into the almighty muddle of confused thoughts and emotions in Campion's tortured mind and opened out like a great question-mark-shaped hole of nothingness. He did not answer because both men were looking at him confidently and he saw that he should have no help from them in his decision. He was the Boss still; they relied on him. He was trying to marshal some sort of order among his scattered forces when another secret question shot out at him. Just how ill am I? Just how serious is this damned injury? Am I going to curl up and die from it, and if so, how long have I got? He put that query away from him impatiently. He guessed he'd find that out when the time came. Meanwhile was was he going to do? There was something just under his nose which he had missed. He felt it was there and he groped for it. When at last he found it it grinned at him with the dreadful crosseyed leer of complete insanity. This was the fourteenth. Therefore, all the arrangements for the catastrophe, or whatever it was he was struggling so blindly to avert, must have been made already, and the thing itself be on the very point of happening..."
This was, far as I'm concerned, a terrific book to curl up with in a comfy chair, hard by the Christmas tree and twinkly lights, a cup of tea by my side and a sigh of pleasant relief in thanks for the sort of fine (if absurd) tale I enjoy reading most on a cloudy winter afternoon. Okay, it's Friday again and this time out that means the last Friday of 2017. So don't forget to check in at author Patricia Abbott's blog, Pattinase, to see what other forgotten or overlooked books other bloggers will be talking about today. Oh, and HAPPY NEW YEAR one and all. Rereading is something i rarely do, but i've done it a lot with Ms. A's books... unashamedly(well, mostly, anyhow), i've found her efforts, compared to many others, thoroughly enjoyable... i admit to some trepidation regarding some of her social attitudes, but they haven't bothered me to the extent of inhibiting my reading pleasure... wonderful cartoon: the New Yorker, isn't it? 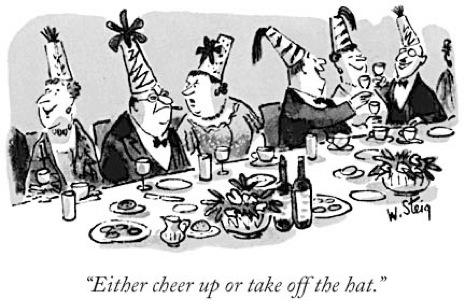 Yes, it's the New Yorker and by William Steig of SHREK fame. :) It's one of my favorites. 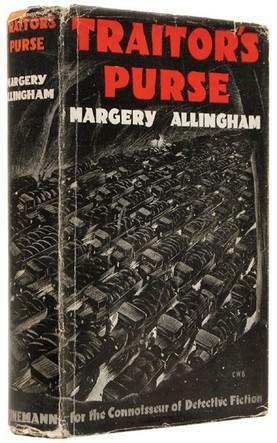 This book of Allingham's I found thoroughly enjoyable too, Mudpuddle. So, so far three wins and one one loss. I'll be reading a few more. Sounds rather James Bondish, Yvette, and I like the amnesia angle. You don't suppose there's a Kindle version? That's where I picked it up, Mathew. I do prefer a regular book, but when needs must. And it's pretty cheap too. Traitor's Purse is the next title I plan to read in the Campion series, Yvette. It will be the third time I have read it but the only thing I remember is that he has amnesia. I am very much looking forward to it, and I hope I like it as much as I did the last two times I read it. I know how that is, Tracy. I reread all the time especially those books I haven't read in years. It's like reading them again for the first time. In fact, I'm currently rereading CAT OF MANY TAILS by Ellery Queen after having read it several times over the years. I read The Crossing Places, Yvette, but can't find your review (which introduced me to Ms. Griffiths). I'd like to link to it when I do my review (loved the book). Can you put the link here as a comment? Many thanks. I apologize for suggesting you add the search feature, Yvette, now that I've found it (altho I had to scroll waaaaaaaay to the bottom of the page! I put mine up high on the right panel. Sorry for the oversight).